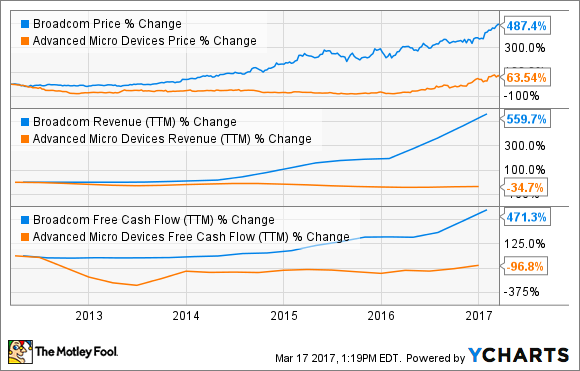 If You Love Advanced Micro Devices, Inc., You Should Check Out Broadcom Ltd. If you're a fan of sustainable long-term growth, the choice is clear. Advanced Micro Devices (NASDAQ:AMD) is a fantastic water cooler stock these days. The ticker sports enormous trading volumes and equally impressive amounts of investor chatter, and all for good reason: AMD shares have gained an outrageous 440% over the last 52 weeks, producing huge returns for investors. But maybe it's time to redirect some of those AMD profits into a different stock. If you love AMD's stock and business plan, you should probably take a closer look at Broadcom (NASDAQ:AVGO) right now. Broadcom is one of the largest semiconductor businesses in the world. Since the $37 billion merger with Avago in 2016, the company has been an undisputed leader in important sectors such as wired and wireless network tools, data storage controllers, and automotive computing. The company is both diverse and strictly focused, picking its target markets with meticulous precision and selling off unwanted operations. For example, Broadcom sold its wireless Internet of Things (IoT) product portfolio last summer to smaller rival Cypress Semiconductor (NASDAQ:CY), collecting a $550 million check while sharpening its business focus. IoT networking is a promising growth market, but could also serve as a distraction from Broadcom's core business operations -- so off to Cypress went the division. 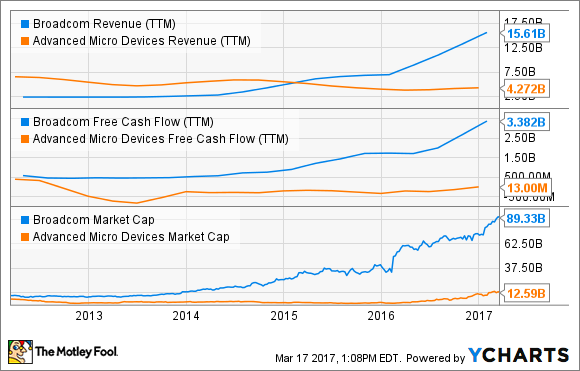 AVGO Revenue (TTM) data by YCharts. What about AMD's market momentum? Past performance is not the same as future returns, of course. No one can guarantee that Broadcom's positive long-term trends will continue forever. On the other hand, the same dictum also applies to AMD's recent surge. Let's be clear about this: AMD is a turnaround story, searching for traction in highly competitive markets. Recent technology updates led to strong sales in both the graphics processor and desktop/notebook markets, giving the company and its investors a welcome break from a long string of failures and disappointments. Buying AMD now is a gamble. You're betting that the company's turnaround efforts will continue to pay off in the face of high-quality competition and a poor track record. Current share prices are built on hopes and dreams and flimsy financials. Broadcom offers a large and stable financial platform, from which the company launches forays into highly targeted markets. This company is an established leader with a top-notch management team, producing annual cash flows roughly the size of AMD's total revenue.